Home › Faith in society › Is open political debate the final Christian taboo? Is open political debate the final Christian taboo? I’m not one for making New Year’s resolutions, but I did spend some time over the Christmas break thinking about this blog and what I wanted to achieve in 2014. One idea that came to mind was to do some research on voting intentions of Christians in the spring with one year to go before the next general election. It still might be worth doing something, but many of the questions I was thinking of asking, have been given answers in the new report by Theos, the Christian think tank, published on Sunday. Voting and Values in Britain: Does religion count? is a weighty and detailed report that provides a wealth of information on the political leanings of different Christian groups along with other religious faiths. The fascinating findings made it into most of the media channels, so I don’t really want to regurgitate fully what has already been written. A helpful summary has been published on the Evangelical Alliance website. Danny Webster who wrote this piece also provides some opinion on the figures on his own blog. Nick Spencer, Theos’ Research Director has provided some further helpful analysis too. What the key findings point to is that among Christians denominations, Anglicans are more likely to vote Conservative, and the more frequently they attend church, the more likely they are to vote that way. Catholic voters, however, favour the Labour party and in this case there is little difference between those who attend and those who do not. For other Christian groups, their voting habits were more fluid, although they did show a noticeable association with support for the Liberal Democrats. What this research shows is that in the UK, unlike the US, voting patterns of Christians are complex; there is no such thing as the Christian vote as one unified force. There are stark differences between denominations, but also frequency of attendance, geographics and demographics make a big difference. This would imply that any political party wishing to specifically target Christian voters is going to struggle. A one size fits all approach will be doomed to failure. Whilst certain faith friendly policies, such as seeking to tackle religious persecution abroad, may appeal to the majority of Christians, deliberately chasing their votes in election campaigns could easily backfire. What becomes apparent over the course of the 128 page report is that Christians vote in similar ways to the rest of the population. Their top priorities at the previous election were the economy followed by immigration. Issues traditionally linked to Christians such as family values and morals were way down the list. Although there is a clear voting divide between different denominations, there are big variations along traditional societal lines, so for example, Catholics are much more likely to vote for Labour if they are female, live in the North, are below retirement age, are in manual ‘blue collar’ jobs and have a house in the public rental sector. This leads to many questions that Voting and Values in Britain does not set out to answer. It gives a thorough overview of which Christians vote for which parties, but does not go into the whys. Why is there such a vast difference between Catholics and Anglicans along the left/right spectrum? Why does attending church regularly put voters closer to the centre ground than others within their denominations who attend less frequently? What these figures reveal is that party political voting habits cannot be tied closely to the Christian faith. Catholics and Anglicans believe in the same God and accept Jesus’ teachings. If one political party in this country was seen to align itself closer to Biblical principles, would that voting divide be so big? Instead how Christian beliefs relate to our views of everyday life are coloured by our situations, culture and background. Do Catholics have a fundamentally different understanding to what makes for a good society compared to Anglicans, or is it that their religious communities, which partly reflect the communities around them have traditionally voted in a certain way and that is carried down through the generations? What does make a difference is that regular worship has a balancing effect. Regular church attenders on average have less hard-line, more centrist views on a range of issues. Listening to regular (hopefully Biblical) teaching in church that teaches compassion and love for others, seeking forgiveness, studying the Bible, prayer and worship all change the way we think and act. We gain a better understanding of what the Christian faith entails; it encourages us to consider others first, rather than our own interests. An active faith according to the Bible will make us more Christ like through the Holy Spirit. That knocks the edges off us and softens more extreme views and increases compassion towards others. According to the report, over 60 per cent of those who never attend church think there should be a death penalty for certain crimes. This percentage drops off rapidly as church attendance increases. It might not be immediately obvious, but these findings are evidence that the Christian faith when practiced is life changing and that our outlook on society and the way we approach our own lives and those of others will be changed as we spend time in God’s presence. ‘What struck me with greatest force when the report was released… was the reaction to the findings, and in particular the idea that Anglicans tend to support the Conservative party. ‘There was a wave of astonishment across Twitter, ‘What!’ they cried, ‘that can’t be true, I’m a Christian and I vote Labour. And so do all my friends’. This is a phenomenon that I too have noticed. Left wing Christians are certainly more vocal and more obviously numerous on Twitter for example. It is the same for those who appear in the media who have made their political preferences known including Giles Fraser and Vicky Beeching. When I have posted articles on this blog that could be interpreted as supportive of the current government or Conservative party, I can often expect to receive some angry replies telling me that no true Christian would vote Conservative. Conversely if I criticise the current government, it is unusual to receive similar criticism. This attitude can be seen on blogs I read too. A couple of weeks ago I found this blog post on benefits and foodbanks which made some important points. It started though by criticising a Christian because they were working as a special adviser to Iain Duncan Smith and therefore by implication, supporting his welfare reforms which the author had little appetite for. In the last few days, the Christian think tank Ekklesia have attacked the Rev Daniel Critchlow for standing as the Conservative candidate in the Sale and Wythenshawe East by-election and endorsing Conservative policies. Is it genuinely possible to claim that it is un-Christian to actively support any of the main political parties and dismiss a large proportion of Christian voters in the process? There might be an case if it were the BNP, but can this really be said for the Conservative party or the Lib Dems? Making sweeping assumptions about someone because they don’t agree with your political views is more than unhelpful. Supporting one particular party does not necessarily mean that you have to endorse or agree with every single policy, just like many Anglicans aren’t signed up to every official practice of the Church of England. We are not clones or robots who have to toe the party line constantly on every occasion without question or thought whether it be in politics, religion or business. Anyone who does unplug their brain to that extent lacks character and is not worth listening to. If Christians are going to be effective at speaking into political situations they need to have weighed up the different sides to any argument and filtered them through the values of their faith. Much of this filtering will come through discourse, but this can only happen if those with opposing views feel able to talk openly without being castigated. Not so long ago homosexuality was seen as the last taboo for Christians. In recent years though and especially during the passage of the Equal Marriage bill through Parliament, Christians with a range of views have candidly expressed them in the open and although there has been a good deal of heated debate, there has also been a consensus that this should be allowed to happen within an environment of good grace where opposing views are respected. This has been a most welcome move even if often the result is an agreement to disagree. Can the same be said of political views amongst Christians? If this is not the case and the conversation is being suppressed, with some feeling unable to share their points of view, then this is both an unhealthy situation and one that is fundamentally wrong. 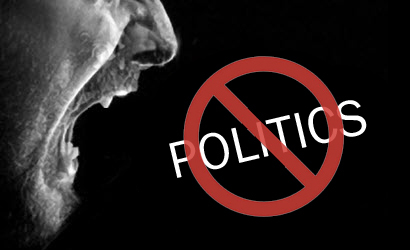 Has open political debate now become the last taboo for Christians? Is the Church of England now the Labour Party at prayer? I think the fairly obvious answer is demographics. The internet is largely dominated by younger people, and younger people tend to be more left wing in their views, being typically unburdened by wealth. It may also be that there are wealth differences between Anglicans and Catholics that are behind the differences in voting intentions. You are right about this, although according to the Theos report, the national trend of older voters being more likely to vote Conservative is less visible among Christian groups. There are fairly similar voting levels for Labour among older and younger Christians. Younger Christians are more likely to vote Lib Dem than older ones though. To some extent yes, but the report shows that younger Anglicans (those under 30) are still much more likely to vote Conservative than Labour (41% to 26% if I can recall correctly). There’s also a distinct Anglican effect over and above class differences, while the gap narrows manual works are more likely to vote Conservative if they are Anglican. Well yes, young Christians are certainly more likely to be socially conservative than their peers, although still more liberal than their parents, but I think economically they’re probably more naturally aligned with the left. I personally would love it if there was a economically left wing but socially conservative party to vote for but socialism seems to have been totally consumed by liberalism. The red Tory and blue labour movements both seem to articulate something of this vision, and its a shame they don’t combine into a party we could actually vote for. @ tommason77 I agree a lot with that statement and would think a lot of Christians would. It is not the economic aspects of Socialism that cause problems is social liberalism, which is why this government cause most concern in my book because they are both economically and socially liberal. In the 19th Century the Conservatives were the natural party of the established church. The Liberals were the natural party for Catholics who were mostly poor, urban and from the Irish diaspora, and for Nonconformists who tended to be moderately poor, have less hierarchical traditions, and resent the established church’s privileges. In the early 20th Century Labour took over from the Liberals as the main anti-privilege party, and most of the Nonconformist churches shrank rapidly. That historic background’s still affecting us today. Ben, thank you for bringing a historical perspective into this. In fact I would trace the link between the Church of England and the Tory party further back, to the 17th century. On this anniversary of the execution of King Charles I, Archdruid Eileen and friends have reminded us, with her rant against Cromwell and the subsequent discussion, that the English Civil War is still a hot issue. As I wrote in my second comment there, positions on this issue probably correlate well with both political and religious divisions in Britain today. Thanks Ben. It shows how much our attitudes are affected by our heritage even if we don’t realise it. I think tommason77’s comments about demographics is bang on. The majority of Christians in this country are of an age where social media usage isn’t as prevalent. They are the ones who are most likely to still hold to traditional models of the nuclear family and are probably quite middle class in their income predisposing them to more conservative position. I have no facts to back that up – it is somewhat a sweeping generalisation. It might just be me but I also think there is a large amount of literature out there that aligns content of the NT with more left leaning political bias. I haven’t really heard many similar articulations for the right which I think encourages the left (already a social media majority) to be more vocal in their convictions. The more right leaning stuff seems to come with a lot of baggage from the US Republican party. Personally I became left leaning the more I got to grips with my faith. When I think of WWJD I don’t see a lot of similarities between him and Margaret Thatcher – if anything its the opposite generally and I’m generally quite happy to speak out about it. I think a lot of it also has to do with Christians various epistemological views and how one approaches society and the Churches place within it. An excellent and thought provoking piece following on from the Theos Report published on Sunday. I agree with much of what you say, Gillan, but I wonder how much longer the current situation will hold? Historically, as Ben has pointed out, our heritage is quite different from most of the rest of Europe (where Christian Democracy developed in its various guises). Here in this Country, you can argue that we have had three political parties heavily influenced by Christian values and activism and this has, in turn, influenced voting patterns. However, as a Lib Dem, I am increasingly concerned about the ever-growing secular direction and views within the Party. I sometimes feel that the environment within the Lib Dems feels hostile to Christianity (and faith groups generally) and I know I am not the only one to feel this way. When canvassing for the Party at the last local elections, I had several people tell me that they would not vote Lib Dem because the Party was hostile to Christians – this is the first time in my experience that people have openly expressed this view on the doorsteps. Clearly, I don’t have the same knowledge about what is happening inside the other Parties, but perhaps the same trends are happening there too. I have certainly heard Conservatives expressing views about David Cameron’s lack of empathy with Christian values. If more Christians start to feel disconnected from their traditional political loyalties, then perhaps, we can start to have that much needed open political debate. To pick up on tommason 77’s point about an economically left wing but socially conservative party, perhaps people may start to look outside of the current Party structures and political policy mixes. Another great blog. Very very good points re left wing Christians being numerous on Twitter! I have also found there to be tonnes and tonnes of Christian feminists on Twitter. I’m not sure why this is. I’m also concerned that often left wing (politically) Christians are left wing theologically. Liberal interpretation of scripture and an over emphasis on social justice. “Jesus was crucified because he hung out with the wrong people” nonsense! Its nice to have people like Cramner around to balance things out. But I often thing Cramner is only allowed to be on the right wing side of things and get away with it because he’s anonymous! This comment is verging on you can’t be left wing and a true Christian. I am theologically conservative, but very left wing economically. I can understand Christians supporting a traditional Conservative party, but I struggle to see what the current guise can offer as it is very liberal in many ways. I read Cranmer and find him very reasonable in his manner and often agree with him. No its not. I never said that? I’m leftwing but doctrinally orthodox/evangelical. I see no contradiction between the two though I am aware of the tensions. My leftwing politics has been controversial at most of the churches I have attended – so it’s odd to hear of people having the opposite experience in Church. My view is that many of the voting patterns can be explained sociologically. In this country, the Anglican church has been the church of the establishment whereas the Catholic Church has, for many decades served working class Irish and other immigrant communities. The Methodist Church has historic links with the Labour Party because Wesley first evangelised the industrial working classes. As things stand today, churches are much much much more successful at reaching middle class communities than working class communities – especially white working class communities (Immigrant communities often have very strong church traditions that they have brought with them). This is partly a resourcing issue: a wealthy congregation can raise more money to employ more staff to reach more people. The inequalities here can be really quite stark and it makes me very angry sometimes because it’s not something that is really recognised as an issue. Sorry I ran out of space! I used to campaign against the BNP and it used to anger me that the communities most blighted by their politics were those most abandoned by the Church. Whenever I saw a Holy Week poster in the window, I could be fairly confident they were Labour and not BNP. In the days when the church was strong in these communities, people used to vote Labour. My point is that the voting intention of churchgoers reflects *who the Church is reaching* as much as it reflects the influence the Church has on people’s voting intention. This is a really good article! I felt very challenged when reading it as I think I am too quick to make sweeping statements about Christian Conservatives (or Conservatives in general) and that’s as a Lib Dem, so I’ve been on the receiving end of those sweeping statements and assumptions many a time. I think it does feel like a taboo and in general, I’ll try to avoid revealing I’m a Lib Dem in social situations, or – if I do – I’ll wince as I say it, anticipating the sarcastic comments that are to follow. I don’t think that changes according to whether the person I’m talking to is a Christian or not…it would be nice if Christians in the UK modelled an example of unity and respect across political boundaries. I know I for one am going to try and change my attitude after reading this piece! Yes, he was concerned about sharing the saving gospel with unbelievers and leading believers to maturity, and, as he could, he addressed these concerns, but his primary calling was to the political arena. As a champion of controversial causes, he was too polarizing to be an effective evangelist or pastor to those who did not share his commitments. An important consideration that’s generated informed comment as well as opening up discussion, the first response to which has just appeared on Gillan’s blog. I find it incomprehensible how one can be a christian and a tory. Politics influeneces every part of day to day living just as religion/faith does so there must be a debate.